Dale Russakoff's “The Prize” is an unsparing chronicle of five controversial years in Newark that began in front of a cheering audience on Oprah and ended this summer with the resignation of Newark Superintendent Cami Anderson. It is an important, thoughtful, and well-researched book, containing meaningful lessons for anyone with even a passing interest in cities, politics, or education. I echo Connor Williams' sentiment that "If you read Russakoff's account and find your beliefs vindicated, you're not trying hard enough." But even if you are trying, what you might miss in “The Prize” is that the past five years have brought real educational gains to Newark students — from a student achievement perspective, Newark’s reforms were anything but a misguided failure. The reforms that “The Prize” treats as a cautionary tale in fact expanded access to high-performing charter schools to the city’s most disadvantaged students. As a result, the number of black students attending schools that “beat the state” in reading and math tripled. As someone who was inspired to join the school reform movement out of a deep conviction that public education ought to be "the great equalizer," I found the behind-the-scenes machinations and obvious paternalism described in “The Prize” jaw-dropping. Yet as much as I loved the depth of Russakoff's reporting on leadership, transparency, and local control, I came away from the book wanting more. As insightful as “The Prize” is on the politics surrounding school reform, it never fully manages to answer the question it presents in its own introduction: "At the heart of it all were the children and a question continually posed by their parents and teachers: Were the battles waged in their name really improving young lives?" So let's tackle that question. If “The Prize” captures the politics of school reform in Newark, what can we learn from a decade-plus of achievement data — especially data on the expansion of charter schools? Spoiler alert: contrary to the dour reviews you might have read elsewhere, the past five years show hopeful news for Newark's kids. There is enormous demand for high-performing schools in Newark — especially charters. Any commentary on education reform in Newark must unify two seemingly contradictory truths: First, that high-performing charter schools are the overwhelming first choice of Newark parents selecting schools for their children in the city's universal enrollment system, and second, that the controversy around the plan that increased access to those schools, named One Newark, reached such a crescendo that it apparently forced Anderson’s resignation (and may even have determined the city's mayoral election). In the first year of One Newark, over 12,000 families submitted applications to the system. The seven most frequently ranked K-8 schools were charters and for more than 50 percent of Newark families, charters were their Number 1 choice. Fully 25% of K-8 applications ranked Uncommon’s schools first; 17% ranked KIPP Number 1. The top-ranked district choice, the high-achieving Ann Street school, accounted for only 5 percent of first-place applications. Before the universal enrollment system, critics of school reform were quick to dismiss figures on charter wait lists as self-reported or overhyped. Those numbers, and the demand they reflect, are now incontrovertible matters of public record, and an inconvenient truth for anyone trying to fit Newark into an anti-school reform talking point. How to square this circle? My reading is that the opposition to the One Newark plan was, first and foremost, a question of trust and community opposition to state control. Far from being a "rebuke of charter schools," the One Newark controversy is much more of a lesson about the how and the who, not the what. In a crucial turning point, more than 75 Newark clergy members released an open letter expressing concerns about One Newark, describing "an overwhelming sense of frustration, community disenfranchisement, and alienation." But overlooked by many observers was that the letter — an enormous public rebuke to Superintendent Anderson — clearly distanced itself from the charter/district debate, declaring "this statement neither condemns nor endorses Charter Schools." I'm reminded of an excellent podcast by Chris Stewart, a black education activist raised in New Orleans, that talked about the feeling of being in "a weird spot, because we agree with a lot of the agenda, and we disagree with the approach." One Newark was firmly in that 'weird spot', engendering enormous opposition even though certain elements of the plan (the universal application system and enrollment preferences for high-needs students) seemingly could have garnered wide support from the community. Anti-charter activists have tried to shoehorn the One Newark story into a district vs. charter talking point, but the actual story described by Russakoff is considerably more nuanced. So what has this dramatic shift from district to charter meant for Newark's African-American student population, across district and charter schools? Changes in the state assessment program over time make it a bit tricky to answer this question, but one way to track results is to look at the performance of Newark kids relative to other students in the state. The chart below shows the percentage of all African-American students (both charter and district) attending Newark schools (again, charter and district) that outperformed the state of New Jersey’s proficiency average. (It covers all tested grades, 3rd-high school, and pools results on reading and math). The percentage of black Newark students attending a school that beat the state proficiency average has tripled in the past 10 years, and this increase can be attributed almost entirely to the growth of the charter sector. For 2014, the most recent year that data is available, more than 40% of the black students enrolled in Newark charters attended a school that beat New Jersey’s average in their grade/subject. In district schools, that was only true for 6% of students. Contrary to some critic’s claims, charter growth hasn’t “eviscerated” the district — at least not from a student achievement perspective. When you compare pass rates on state assessments for African-American students in Newark Public Schools to the state , it’s flat. The percentage of students attending schools beating the state average in reading and math is about the same in 2014 as it was in 2006. That sameness to the Newark Public Schools' performance also means that the much stronger showing of charter schools when compared to the state average cannot be explained by high-performing students selectively leaving district schools for charters. This is real academic progress for Newark’s most underserved students. Students enrolled at Newark charters made additional learning gains of more than 0.2 standard deviations in both reading and math — or in plain English — they gained "an additional seven and a half months in reading per year and nine months per year in math compared to their traditional public school counterparts." The CREDO report is the most rigorous work conducted on Newark charter schools, by a considerable margin. Their research team had access to individual student records, which means that their analysis could control for individual student demographic characteristics, making it much more robust than any work that depends only on the school-level totals released by the state. CREDO's research methodology has been peer-reviewed and scrutinized by technical experts. Keep in mind that an earlier CREDO study on a national sample of charter schools was a frequent talking point for reform critics. That was until subsequent CREDO work showed that "Urban charter schools in the aggregate provide significantly higher levels of annual growth in both math and reading." The CREDO work spotlighted particularly strong gains for Newark charters with African-American students. In fact, Newark's charter sector ranked Number 1 in the nation for African-American achievement gains in reading. These numbers are echoed by independent analyses of KIPP's achievement data, like the recent Mathematica study, which used gold star experimental methods and found that KIPP elementary, middle and high schools had "positive, statistically significant, and educationally meaningful impacts" on student achievement. Mathematica's review of Uncommon Schools, the network that runs the North Star schools, found "statistically significant… [and] substantively meaningful" impacts on math and reading achievement. As you can probably guess, there's been a healthy back-and-forth between the CREDO team and school reform skeptics. You can read the technical appendix if you want the blow-by-blow details. More research on Newark charters would be great, and it would be nice to see additional experimental designs, to rule out any shadow of a doubt about these findings. But the bottom line here is that all of the high-quality research work done on Newark charter schools points to real, meaningful learning gains. It's borne out in the state achievement data, and supported by independent and credible evaluations of KIPP and Uncommon Schools. It's no longer enough to quibble about experimental methods — there's a substantial body of evidence on Newark charters, and it all points in the same direction. Most stories on Newark cite the aggregate enrollment numbers, noting that students are split roughly 70 percent to 30 percent between traditional district and charter schools. While accurate, those statistics miss a much more dramatic story happening within the city. Charters enrolled 42 percent of the city's African-American students last year, and are on pace to enroll fully half of the city's African-American population in the 2015-16 school year, or soon thereafter. Breaking these enrollment figures out by ward shows that these changes haven't been a uniform, citywide phenomenon — rather, the movement out of district schools is uneven. Schools in the South and West wards, historically the city's lowest performing, have seen parents defect in droves to charter options. 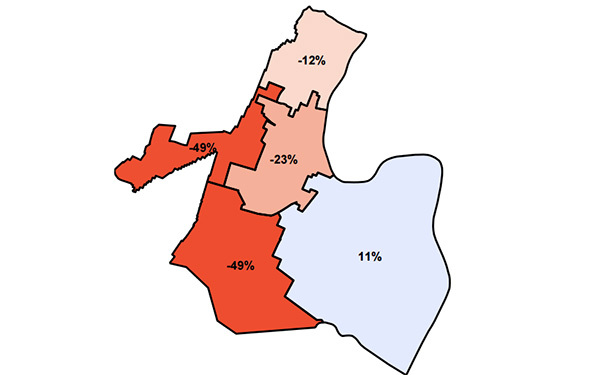 The following map shows change in enrollment in Newark Public Schools, using 1998 (the first year of data published online) as a baseline. Enrollment in district schools is down by nearly 50 percent in the South and West wards and with total Newark school enrollment (district plus charter) basically flat, it's abundantly clear that those students are now in Newark charters. In the East ward, Newark's predominantly Portuguese and Hispanic neighborhood, enrollment in district schools is actually up in real terms from the 1998 baseline. By far the most contentious debates around the One Newark plan revolved around the district's decision to close several neighborhood schools in the South, West and Central wards. I can't possibly do justice to the complex debate around the merits of school closures here (Jelani Cobb's excellent piece on Jamaica High School is highly recommended as a primer on the history and politics around school closures), but it's important to note that the long-term enrollment trends were the backdrop against which all of the One Newark decisions were being made. These numbers have been missing from a lot of the commentary and coverage of One Newark over the past year. Declining enrollment is, of course, no excuse for haphazard communication and the general confusion chronicled in “The Prize.” Some of the school closure decisions, like the proposal to close the Hawthorne Avenue school lacked support when the available achievement data was examined closely, and rightfully garnered significant criticism. But the basic causality — that kids in the West and South wards exited the district in large numbers, leaving half-empty, under-utilized buildings, which necessitated some kind of response from the district — isn't in any real dispute. Newark Public Schools was maintaining costly, aging buildings designed to hold many thousands of students who had left long ago. “The Prize” gives a pretty damning verdict on the leadership, outreach, and planning behind the particulars of One Newark, but those shortcomings don't negate the case that this data cried out for some kind of action. The average reader of reviews of “The Prize” could be forgiven for imagining vibrant schoolhouses turning into vacant, shuttered buildings, all thanks to the One Newark plan. It's hard for school closures not to conjure up those fears, especially after what happened to many schools in Chicago, where approximately 50 neighborhood schools were closed in 2013. But the One Newark K-8 'closures' were a lot different. In those three instances, management and staffing changed, but the schools didn't close their doors — they still have students, still have classrooms, still have teachers, and still enroll Newark kids. KIPP New Jersey ran one of these schools, taking over operation of the Bragaw Avenue school as an elementary turnaround. As a Newark Public School campus, enrollment had steadily fallen for more than a decade, with only 250 students remaining, often in 'grade levels' that consisted of a single classroom. Under KIPP's management, 565 K-4 students filled up the building, and significant resources were invested in repairs and upgrades to the physical plant. The students who used to attend the school were guaranteed seats in the new school. That's not a school closure — that's a school revitalization. Newark's charters are public schools, free for parents and students with open admissions and no special requirements. They are regulated by the state of New Jersey, and accountable for strong academic performance, sound financial management, and compliance with all relevant state laws. Yet even strong charter proponents have recognized the potential for district/charter comparisons to be subtly skewed by a potential "chooser" effect — namely, that parents having to learn about and enroll in the school creates the possibility that the savviest ones get the seats. This is why the best research on charters (like the Mathematica study cited above) uses a “gold standard” research design, where lottery winners are compared to lottery losers. Matching apples to apples ensures that the school's contribution to student learning is being measured, not some artifact of the student's background. That research shows that the "chooser" effect does not explain KIPP's student achievement results, noting that "the students entering KIPP schools look much like other students in their neighborhoods: low-achieving, low-income, and non-white." Lost in the stories about the messy rollout and implementation of One Newark was some very good news for Newark families. The reforms brought all the disparate enrollment systems for each individual charter school under one roof, creating a common citywide application that made the process for enrolling in a charter school exactly the same as enrolling in a district school. Not only did the universal enrollment system make things simpler for parents, it went a step further, giving high-need students preference, making it more likely that disadvantaged families would be able to access top-performing schools. That's an astounding achievement, and one for which the district never really got credit. Instead of a system where every family was left to fend for itself, Newark now had a system that could negate the chooser effect, creating preferences for special needs and low-income students that increased the likelihood that they would attend a high-performing school. In a particularly galling and cynical move, reform opponents cited these enrollment preferences for Newark's most disadvantaged students in their lawsuit against the superintendent, claiming that these preferences were a technical violation of state “open enrollment” rules. In a memorable passage in “The Prize,” Superintendent Anderson invoked the notion of the “lifeboat” theory of education reform. She worried that the most advantaged students would exit the district, leaving the city’s public schools with an increasingly needy population of students to educate. If this narrative, also called “cream-skimming” were true, you would expect to see an ever-widening gap between district and charter schools on demographic characteristics like free lunch or special education status. But that's not the pattern that shows up in state enrollment data. In fact, the opposite is true. In the last school year, Newark charters enrolled a higher percentage of economically disadvantaged students than the district did. It's true that there are some areas where Newark charters lag the district — special education enrollment, for one. Because New Jersey no longer publishes special education data in the main enrollment files, reliable numbers can be hard to come by. The 2014 CREDO report had the percentage of special education students in Newark charters at 10 while district schools were at 15 percent. It's not clear how much of that stems from differences in classification practices, and how much comes from genuine differences in enrollment patterns — especially since Newark Public Schools officials concluded that the district suffers from an over-diagnosis problem. KIPP's percentage of special needs students in Newark is 12 — in line with district figures for middle and high school but lower at the elementary level, where students have started with us in kindergarten and received early academic interventions to keep them on track. Charters can (and should) do more to serve special education students, especially now that they are reaching a 50 percent share of the student population in several neighborhoods. KIPP, for instance, is opening two therapeutic self-contained special education programs this year that will help us better serve students who need a specialized classroom environment. Any charter that fails to serve students with special needs is failing its commitment to the community, and should face serious sanctions. Reasonable observers can and should push the charter sector to do more, and identify disparities where they exist. But the bottom line here is that the enrollment data simply isn't consistent with a “cream skimming” thesis. Charter school enrollment has grown enormously over the past five years, but the percentage of free and reduced-priced lunch students in the district has gone down, not up. Charters now enroll a higher percentage of free and reduced-priced lunch students than Newark Public Schools and are drawing students from Newark's neediest neighborhoods. While the data for students with special needs suggests more can be done (like the enrollment preferences created in One Newark), it's hard to argue with a straight face that a 5 percentage point difference in special education status explains the enormous differences in outcomes between charter and district schools. 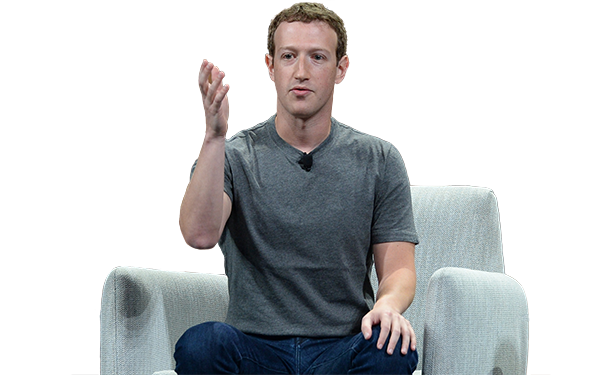 It's hard not to look back at the Zuckerberg gift and wonder what might have been — one need only look a few miles downstate to Camden, where the hard work of improving a broken school system is being done in a way that brings in community members (and without the benefit of the Zuckerberg windfall). But when I look at the Newark school system, charter and district, I don't see the failure that Kotlowitz seems to perceive. Cami Anderson and Cory Booker might be gone, but the teachers, principals, and school operators who were in Newark before they came didn't move on. The heroes of Russakoff's book — the "outstanding teachers" doing the "punishing, unglamorous work" in classrooms across the city — haven't gone anywhere. Through their efforts, there are now three times as many African-American students who attend a Newark school that beats the state proficiency average. “The Prize” may document a failure of politics and leadership, but for Newark's neediest kids, the achievement data shows five years of slow, steady improvement — almost entirely because of the movement to high-performing charters. 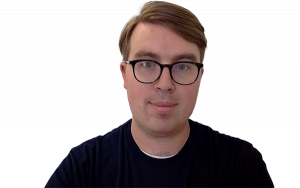 Andrew Martin is the director of special projects at KIPP New Jersey, a former classroom teacher for both KIPP and the New York City Department of Education, and a graduate of the University of Chicago.